Springer Spaniel Grooming – Are Dew Claws A Problem? Just a quick note here about dew claws – a topic which crops up from time to time for springer spaniel owners. Dew claws grow on the rear of the lower leg and are vestigial ‘thumbs’ left over from ancient genetic lines, originally used for gripping prey. They serve no practical purpose on springer spaniels, though in a few breeds (e.g. the Great Pyreneean) they are considered to be essential. On other breeds, where the dew claw is lower on the paw then they can grow inward (like an ingrowing toenail), giving rise to discomfort, even infection. When the dog is running around in undergrowth, or a working springer is retrieving, then dew claws can snag and cause the dog injury. That in itself is a good reason for their removal – it is not a cosmetic surgery issue. American Kennel Club breed standards allow the removal of dew claws for both English springer spaniels and Welsh springer spaniels. In some countries, removal of dew claws other than from a pup whose eyes are still closed, must be done by a licensed veterinarian under anaesthetic, else the procedure is considered to be mutilation and may even be illegal. Most breeders will remove dew claws from the new-born pups – the procedure is simple. Any trimming around the dew claws does not then become an issue for the adult springer spaniel grooming process. 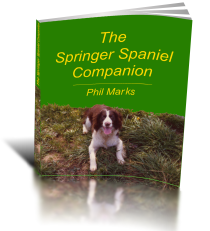 Previous Previous post: Springer Spaniels Rescue – What’s It All About? Next Next post: Springer Spaniels Rage – An Urban Myth?